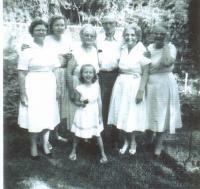 Arnott and Vederoff Ancestors - From left, Bina Ruth Brown, Eudora Prasifka, Nebraska (Welborn) Brown, Charles and Beulah Dillon, Eulah Ainsworth Wilson. Child in front is Joi Prasifka. Photo taken May 27, 1962. From left, Bina Ruth Brown, Eudora Prasifka, Nebraska (Welborn) Brown, Charles and Beulah Dillon, Eulah Ainsworth Wilson. Child in front is Joi Prasifka. Photo taken May 27, 1962.